Walking distance to Nelson's famous Tahunanui Beach, Access to Tahunanui Conference Function Centre, and only 4.5km from the city centre. Cooked/continental breakfast, corporate, long-stay packages and low-season specials available. Newly refurbished units offering superior decor, comfort and relaxation for corporate guest or regional visitor. Individual patios capturing afternoon sun overlooking mediterranean inspired private gardens. The ideal choice for the corporate traveller or families wanting a stress free holiday. Qualmark four star rating means you are assured of a quality experience during your stay. Ra and David invite you to relax in spacious, sunny and private Nelson accommodation, amidst trees and gardens away from the main road noise, yet minutes from the Nelson city centre. We endeavour to provide you everything you need for a great stay with us. Our rooms are all well equipped along with guest laundry, BBQ area and much more. Comprising of 16 architecturally designed purpose-built luxury accommodation units suitable for corporate travellers and family holidays. 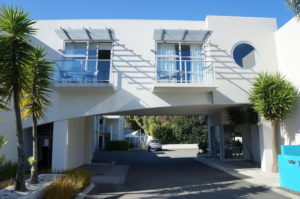 Abelia Motor Lodge is situated in Tahunanui Nelson New Zealand. The famous Nelson Tahunanui beach, shops and a variety of restaurants are all only 10 min walk from the motel accommodation.Seaside Nelson golf course is also within 2 to 3 minutes drive.